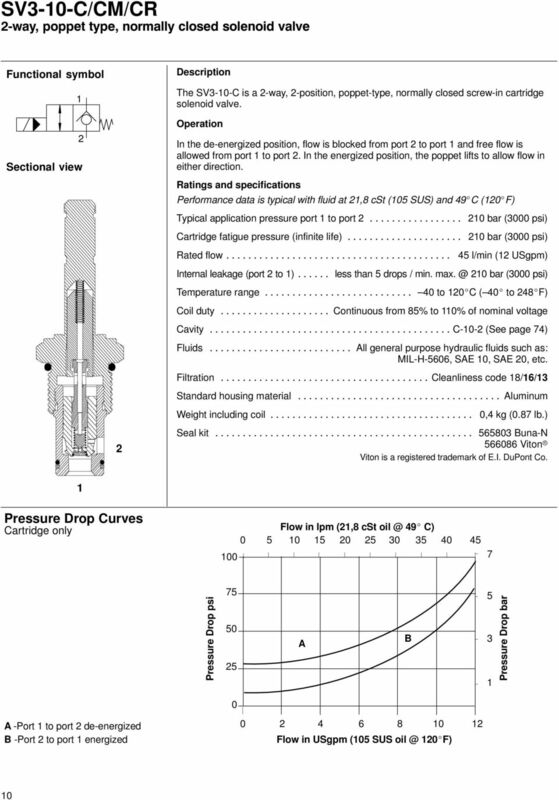 Download "Cartridge Valves. Solenoid Valves. Vickers. Screw-in Cartridge Valves. Maximum Pressure 210 bar (3000 psi) Maximum Flow 227 l/min (60 USgpm)"
2 Introduction For over seventy years, Vickers has provided its customers with quality products and innovative solutions for all their power and motion control needs. We are committed to maintaining this position by offering the most comprehensive range of cartridge valves for industrial and mobile equipment. 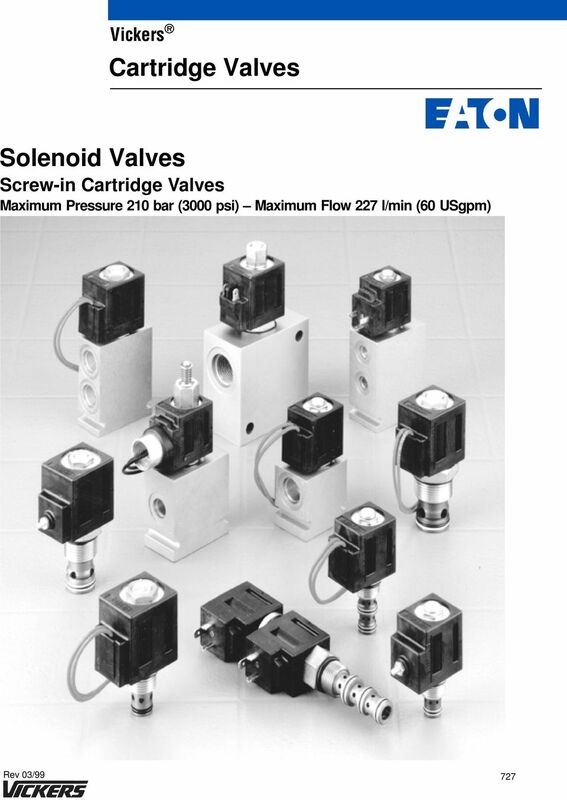 The products featured in this catalog represent the very best in screw-in cartridge solenoid valve technology. Products in this catalog have been fatigue tested for one million cycles at % or million cycles at 5% of rated pressure. 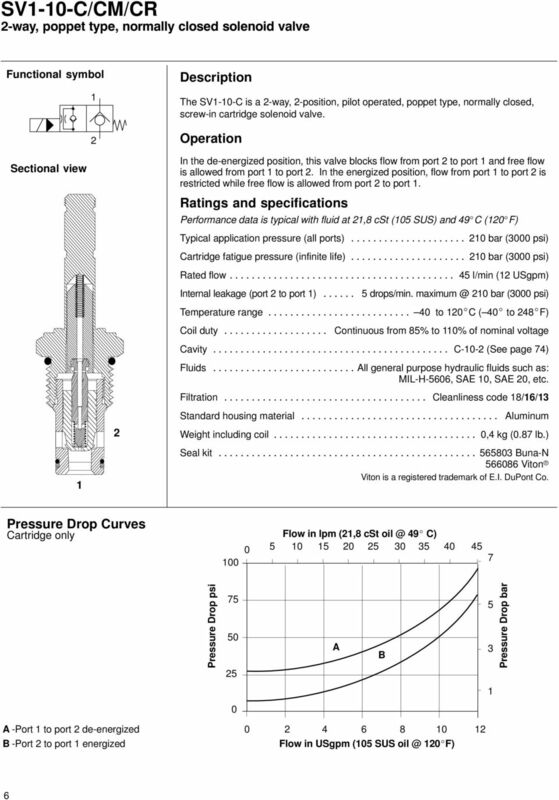 Two pressure ratings are shown for all products featured in this catalog typical application pressure and fatigue pressure. 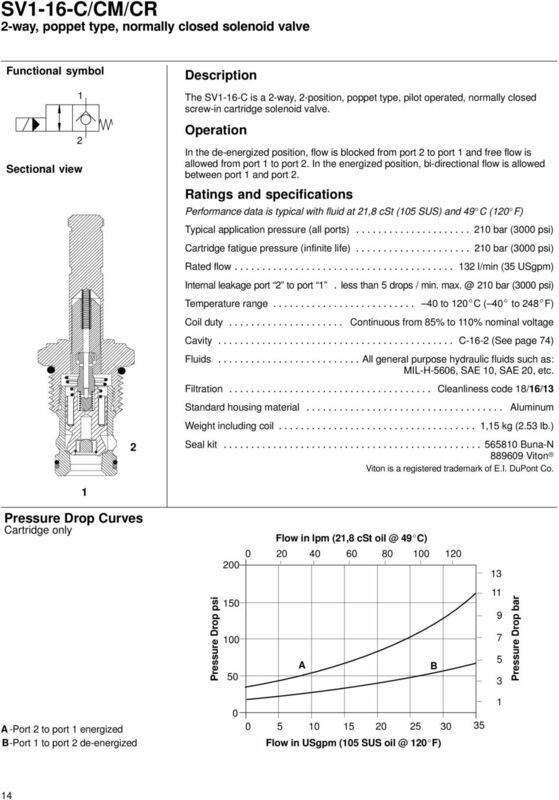 The typical application pressure rating is the maximum recommended operating pressure for the valve in a given system. 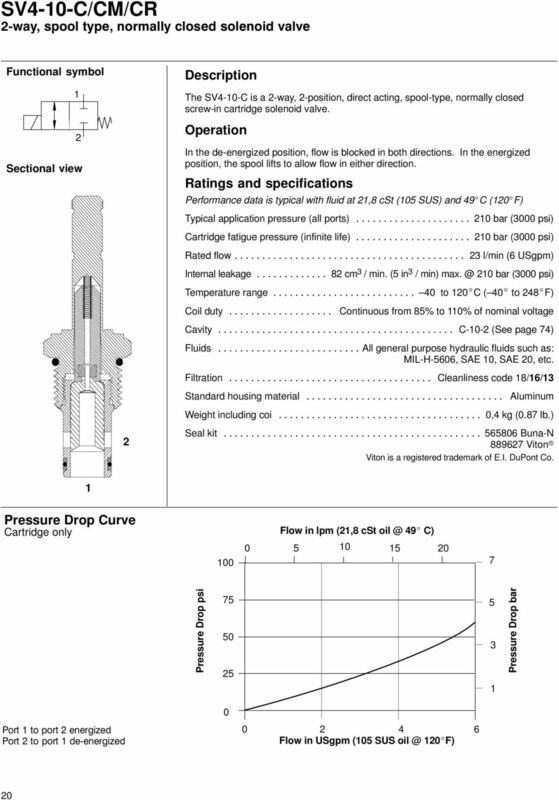 The fatigue pressure rating is the pressure for the valve to be free for infinite life from metal fatigue. 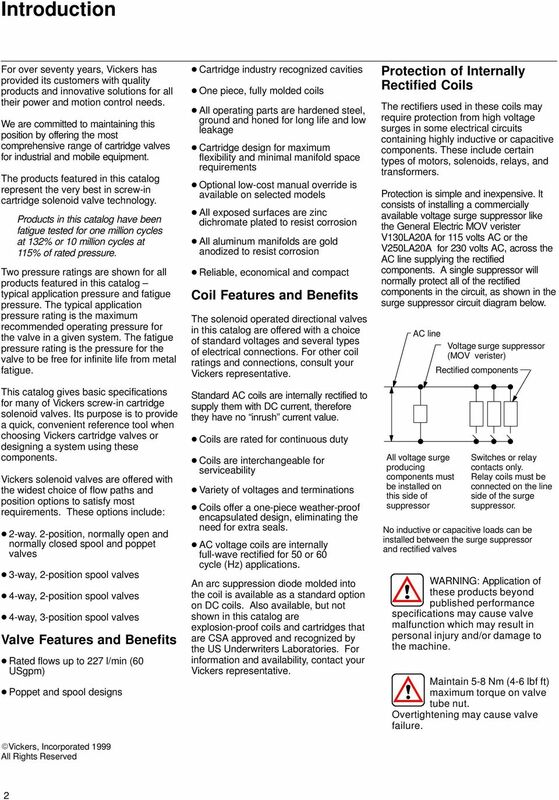 This catalog gives basic specifications for many of Vickers screw-in cartridge solenoid valves. Its purpose is to provide a quick, convenient reference tool when choosing Vickers cartridge valves or designing a system using these components. Vickers solenoid valves are offered with the widest choice of flow paths and position options to satisfy most requirements. These options include: -way. -position, normally open and normally closed spool and poppet valves -way, -position spool valves -way, -position spool valves -way, -position spool valves Valve Features and Benefits Rated flows up to 7 l/min (6 USgpm) Poppet and spool designs Vickers, Incorporated 999 All Rights Reserved Cartridge industry recognized cavities One piece, fully molded coils All operating parts are hardened steel, ground and honed for long life and low leakage Cartridge design for maximum flexibility and minimal manifold space requirements Optional low-cost manual override is available on selected models All exposed surfaces are zinc dichromate plated to resist corrosion All aluminum manifolds are gold anodized to resist corrosion Reliable, economical and compact Coil Features and Benefits The solenoid operated directional valves in this catalog are offered with a choice of standard voltages and several types of electrical connections. For other coil ratings and connections, consult your Vickers representative. Standard AC coils are internally rectified to supply them with DC current, therefore they have no inrush current value. Coils are rated for continuous duty Coils are interchangeable for serviceability Variety of voltages and terminations Coils offer a one-piece weather-proof encapsulated design, eliminating the need for extra seals. AC voltage coils are internally full-wave rectified for 5 or 6 cycle (Hz) applications. An arc suppression diode molded into the coil is available as a standard option on DC coils. Also available, but not shown in this catalog are explosion-proof coils and cartridges that are CSA approved and recognized by the US Underwriters Laboratories. For information and availability, contact your Vickers representative. Protection of Internally Rectified Coils The rectifiers used in these coils may require protection from high voltage surges in some electrical circuits containing highly inductive or capacitive components. These include certain types of motors, solenoids, relays, and transformers. Protection is simple and inexpensive. It consists of installing a commercially available voltage surge suppressor like the General Electric MOV verister VLAA for 5 volts AC or the V5LAA for volts AC, across the AC line supplying the rectified components. A single suppressor will normally protect all of the rectified components in the circuit, as shown in the surge suppressor circuit diagram below. AC line All voltage surge producing components must be installed on this side of suppressor Voltage surge suppressor (MOV verister) Rectified components Switches or relay contacts only. Relay coils must be connected on the line side of the surge suppressor. No inductive or capacitive loads can be installed between the surge suppressor and rectified valves WARNING: Application of these products beyond published performance specifications may cause valve malfunction which may result in personal injury and/or damage to the machine. Maintain 5-8 Nm (-6 lbf ft) maximum torque on valve tube nut. Overtightening may cause valve failure. 11 Model Code SV--C/CM/CR Function SV Solenoid valve Size - Size Seals Blank- Buna-N V - Viton Style C - Normally closed 5 Manual override option Blank - No manual override M - Knob type R - Cable type 6 Port size - Cartridge only Code B 6T G G 6H 8H Port size /8 BSPP SAE 6 / BSPP /8 BSPP SAE 6 SAE 8 Housing number See pages 76 & 77 for housings 8 Connector types Blank - No coil G - ISO DIN P - / NPT conduit port w/ leadwire Q - Spade terminals Voltage rating - No coil D - VDC D - VDC 6D - 6VDC A - VAC A- VAC A- VAC B - VDC/w diode* B - VDC/w diode* W - Leadwire N - Deutsch Y - Amp JR *optional arc suppression diode Dimensions mm (inch) 9, (.77) 8,9 (.5) 6, (.8) 8,6 (.) 9, (.75) hex Torque cartridge in housing 7-5 Nm (5- lbf ft) Valve is shown with W coil. See other coils on page 8. 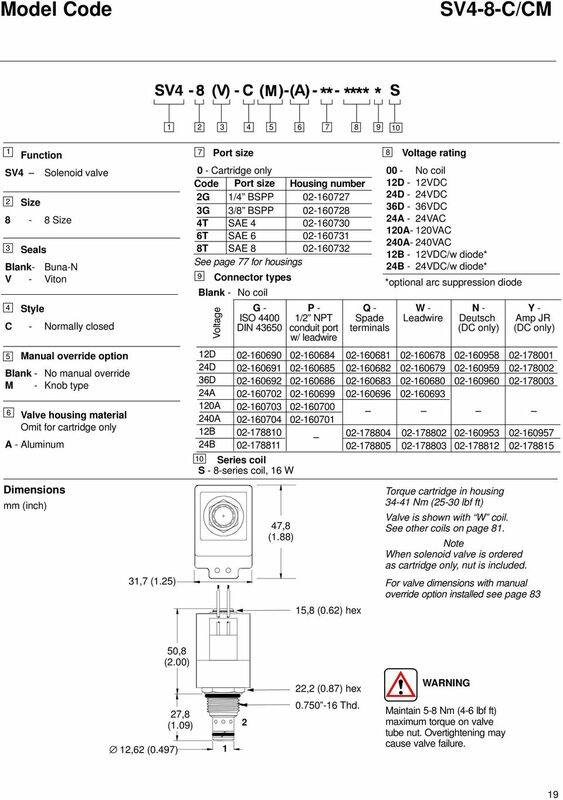 Note When solenoid valve is ordered as cartridge only, nut is included. 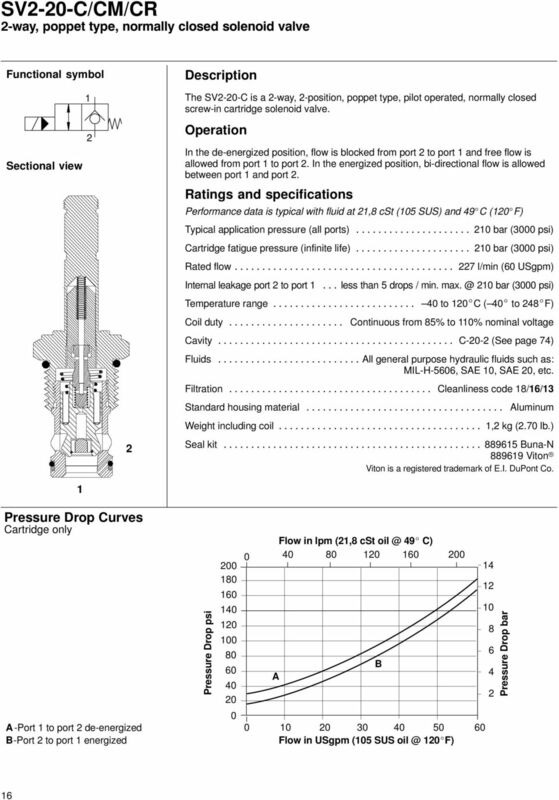 For valve dimensions with manual override option installed see page Thd. 5,8 (.6) WARNING Maintain 5-8 Nm (-6 lbf ft) maximum torque on valve tube nut. Overtightening may cause valve failure. 13 Model Code SV--C/CM/CR Function SV Solenoid valve Size - Size Seals Blank- Buna-N V - Viton Style C - Normally closed 5 Manual override option Blank - No manual override M - Knob type R - Cable type 6 Valve housing material Omit for cartridge only A - Aluminum 7 Port size - Cartridge only Code Port size Housing number G 6G T T G 6G T T / BSPP / BSPP SAE SAE / BSPP / BSPP SAE SAE -68 (C--) -67 (C--) -66 (C--) -66 (C--) -66(C--U) -65(C--U) -66(C--U) -665(C--U) See page 77 for housings Connector types Blank - No coil G - ISO DIN P - / NPT conduit port w/ leadwire Q - Spade terminals Cavity Blank - Cavity w/o undercut U - Cavity w/undercut 9 Voltage rating - No coil D - VDC D - VDC 6D - 6VDC A - VAC A- VAC A- VAC B - VDC/w diode* B - VDC/w diode* *optional arc suppression diode W - Leadwire N - Deutsch Y - Amp JR Dimensions mm (inch) 9, (.77) 8,9 (.5) 59,8 (.6) 6, (.8) 8,6 (.) 9, (.75) hex Torque cartridge in housing 8-95 Nm (6-7 lbf ft) Valve is shown with W coil. See other coils on page 8. Note When solenoid valve is ordered as cartridge only, nut is included. 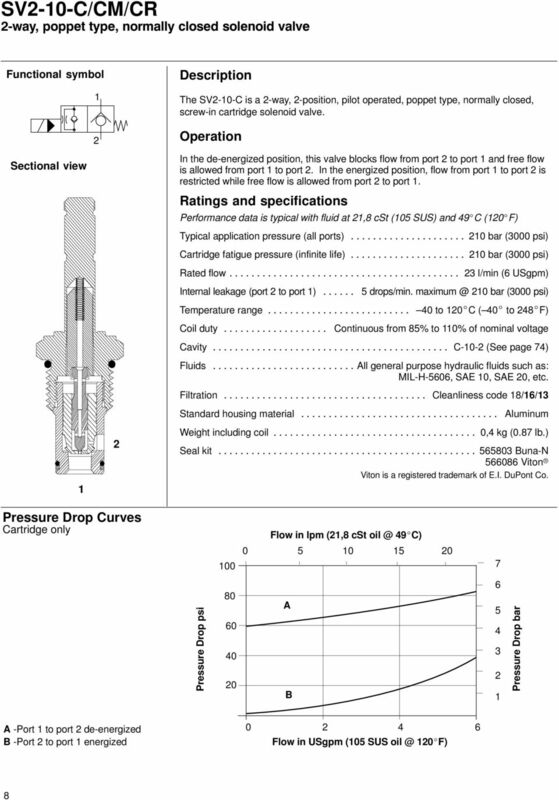 For valve dimensions with manual override option installed see page 8,7 (.76),75 (.95),7 (.5) hex.6 - Thd. WARNING Maintain 5-8 Nm (-6 lbf ft) maximum torque on valve tube nut. Overtightening may cause valve failure. 21 Model Code SV--C/CM/CR Function SV Solenoid valve Size - size Seals Blank- Buna-N V - Viton Style C - Normally closed 5 Manual override option Blank - No manual override M - Knob type R - Cable type 6 Port size - Cartridge only Code Port size Housing number B 6T G G 6H 8H /8 BSPP SAE 6 / BSPP /8 BSPP SAE 6 SAE See pages 76 & 77 for housings 8 Connector types Blank - No coil G - ISO DIN P - / NPT conduit port w/ leadwire Q - Spade terminals Voltage rating - No coil D - VDC D - VDC 6D - 6VDC A - VAC A- VAC A- VAC B - VDC/w diode* B - VDC/w diode* W - Leadwire N - Deutsch Y - Amp JR *optional arc suppression diode Dimensions mm (inch) 9, (.77) 8,9 (.5) 6, (.8) 8,6 (.) 9, (.75) hex Torque cartridge in housing 7-5 Nm (5- lbf ft) Valve is shown with W coil. See other coils on page 8. 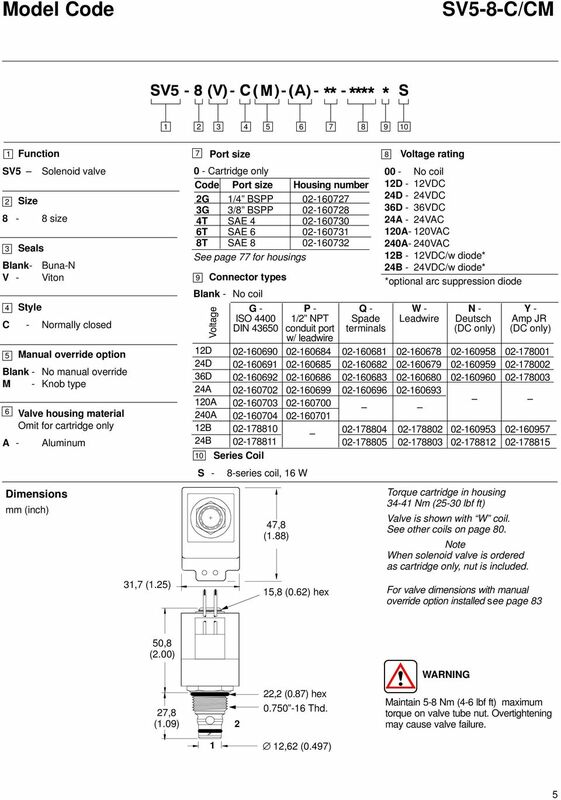 Note When solenoid valve is ordered as cartridge only, nut is included. 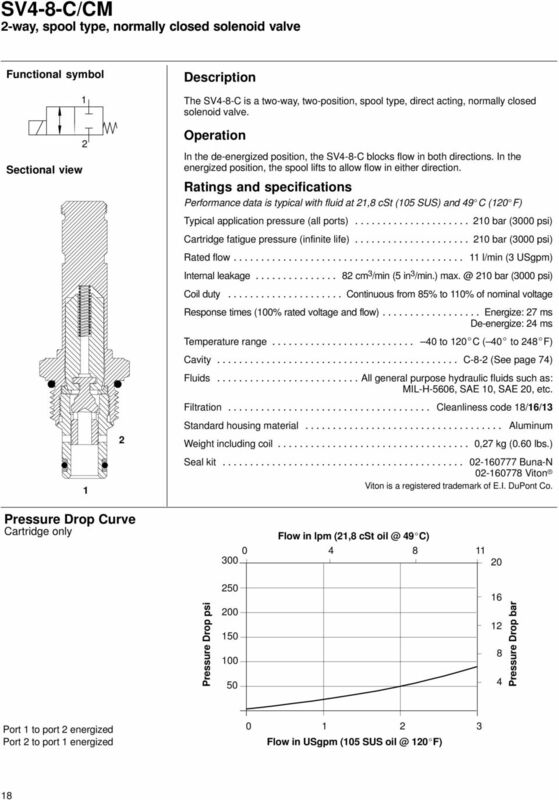 For valve dimensions with manual override option installed see page 8 5, (.) hex 5,8 (.6) Thd. WARNING Maintain 5-8 Nm (-6 lbf ft) maximum torque on valve tube nut. Overtightening may cause valve failure. 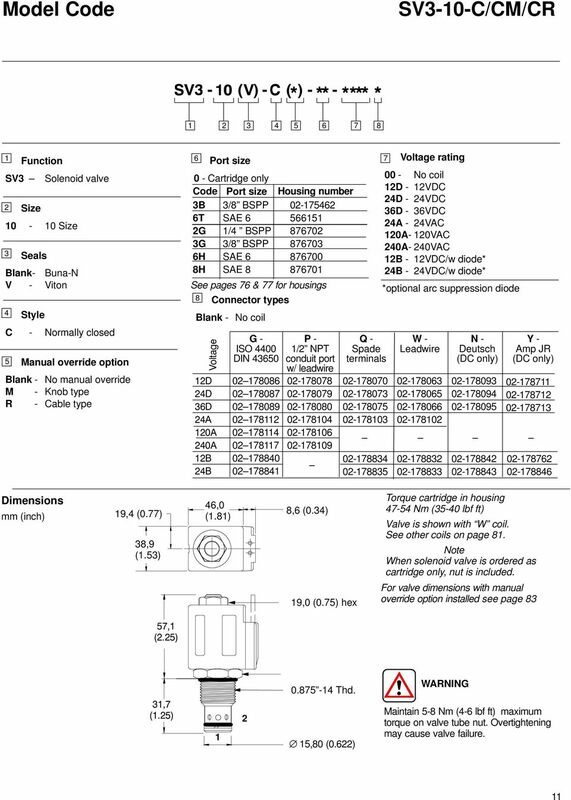 23 Model Code SV5-8-O/OP/OS Function SV5 Solenoid valve Size 8-8 Size Seals Blank- Buna-N V - Viton Style O - Normally open 5 Manual override option Blank - No manual override P - Push type S - Screw type 6 Housing material omit for cartridge only A - Aluminum Dimensions mm (inch) 7 Port size 8 - Cartridge only Code Port size Housing number G / BSPP -677 G /8 BSPP -678 T SAE -67 6T SAE T SAE 8-67 See page 77 for housings 9 Connector types Blank - No coil S G - ISO DIN Series coil 8-series coil 7,8 (.88) P - / NPT conduit port w/ leadwire Q - Spade terminals W - Leadwire Voltage rating - No coil D - VDC D - VDC 6D - 6VDC A - VAC A- VAC A- VAC B - VDC/w diode* B - VDC/w diode* *optional arc suppression diode N - Deutsch Y - Amp JR Torque cartridge in housing - Nm (5- lbf ft) Valve is shown with W coil. See other coils on page 8. 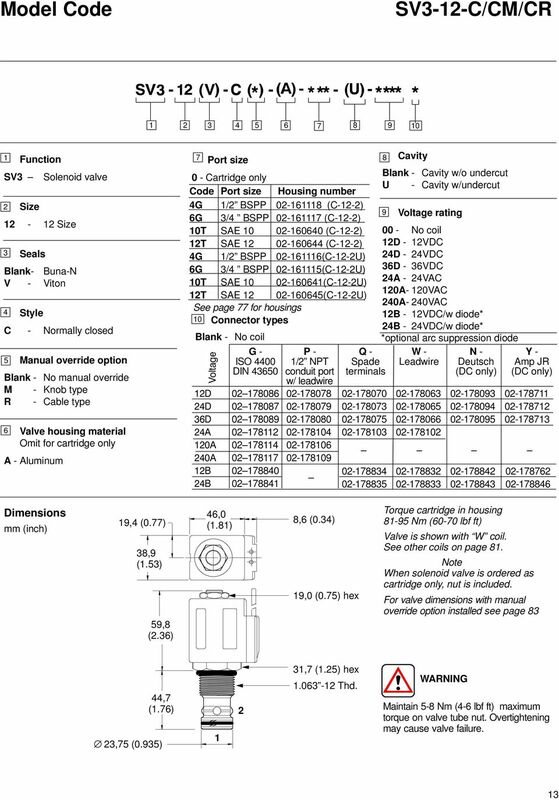 Note When solenoid valve is ordered as cartridge only, nut is included.,7 (.5) 5,8 (.6) hex For valve dimensions with manual override option installed see page 8 5,8 (. ), (.87) hex WARNING 7,8 (.9).75-6 Thd.,6 (.97) Maintain 5-8 Nm (-6 lbf ft) maximum torque on valve tube nut. Overtightening may cause valve failure. 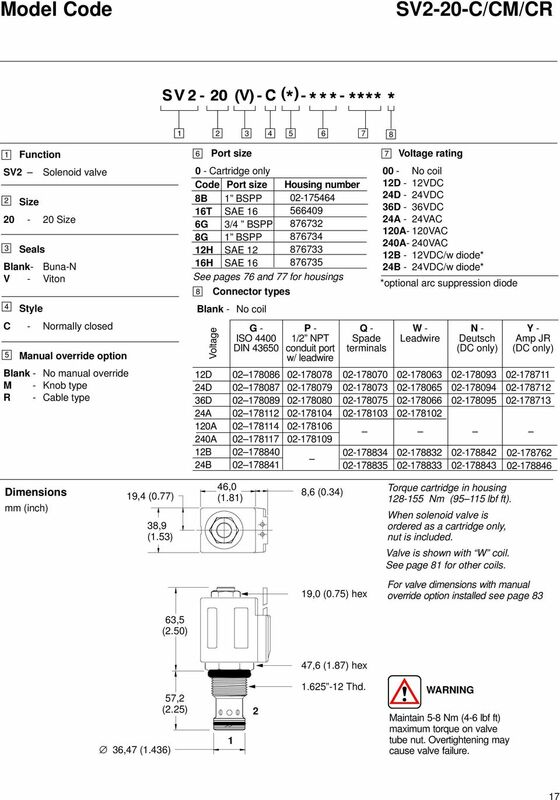 31 Model Code SV-6-O/OP/OS Function SV Solenoid valve Size 6-6 Size Seals Blank- Buna-N V - Viton Style O - Normally open 5 Manual override option Blank - No manual override P - Push type S Screw type 6 Port size - Cartridge only Code 6B T 6G H H See pages 76 and 77 for housings 8 Blank - No coil Port size / BSPP SAE / BSPP SAE SAE G - ISO DIN Housing number P - / NPT conduit port w/ leadwire Q - Spade terminals W - Leadwire Voltage rating - No coil D - VDC D - VDC 6D - 6VDC A - VAC A- VAC A- VAC B - VDC/w diode* B - VDC/w diode* *optional arc suppression diode N - Deutsch Y - Amp JR Dimensions mm (inch) 9, (.77) 8,9 (.5) 6, (.8) 8,6 (.) Torque cartridge in housing 8- Nm (8-9 lbf ft) Valve is shown with W coil. See other coils on page 8. Note When solenoid valve is ordered as cartridge only, nut is included. 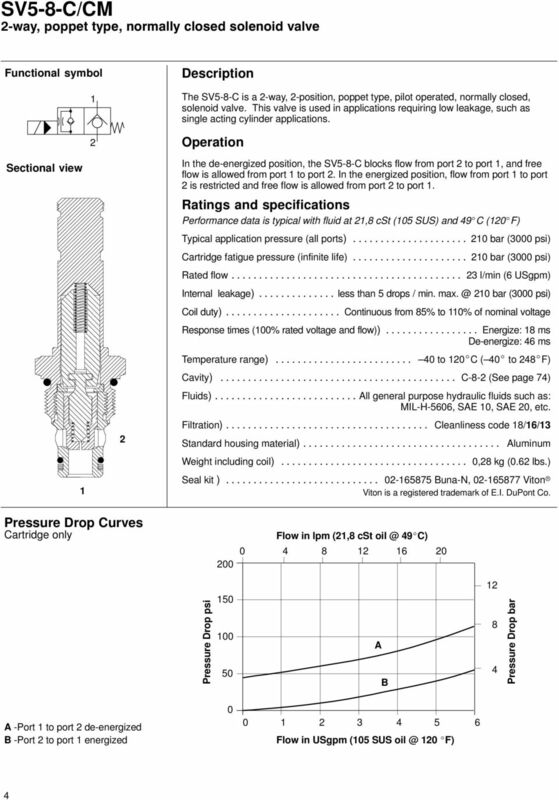 9, (.75) hex For valve dimensions with manual override option installed see page 8 8, (.5) hex. - Thd 8,55 (.) WARNING Maintain 5-8 Nm (-6 lbf ft) maximum torque on valve tube nut. Overtightening may cause valve failure. 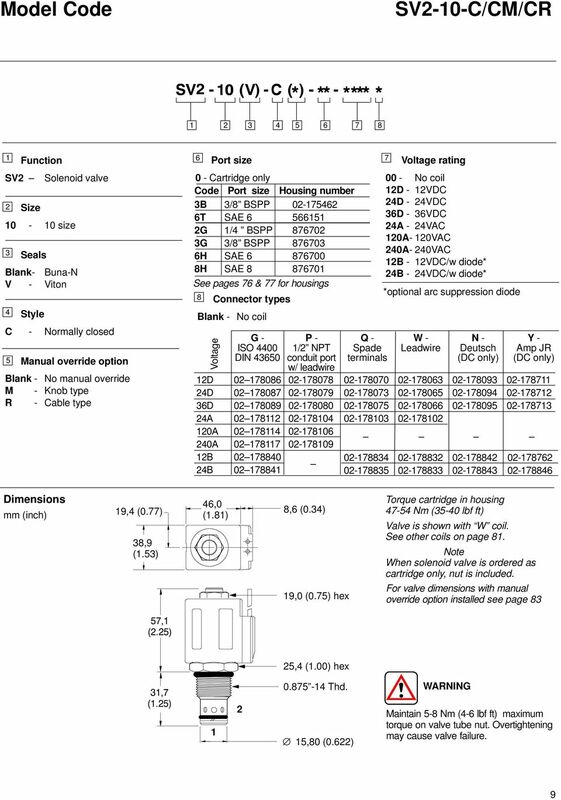 33 Model Code SV--O/OP/OS Function SV Solenoid valve Size - Size Seals Blank- Buna-N V - Viton Style O - Normally open 5 Manual override option Blank - No manual override P - Push type S - Screw type 6 Port size - Cartridge only Code 8B 6T 6G 8G H 6H Port size BSPP SAE 6 / BSPP BSPP SAE SAE 6 Housing number See pages 76 & 77 for housings 8 Connector types Blank - No coil G - ISO DIN P - / NPT conduit port w/ leadwire Q - Spade terminals W - Leadwire Voltage rating - No coil D - VDC D - VDC 6D - 6VDC A - VAC A- VAC A- VAC B - VDC/w diode* B - VDC/w diode* *optional arc suppression diode N - Deutsch Y - Amp JR Dimensions mm (inch) 9, (.77) 8,9 (.5) 6, (.8) 8,6 (.) Torque cartridge in housing 8-55 Nm (95-5 lbf ft) Valve is shown with W coil. See other coils on page 8. 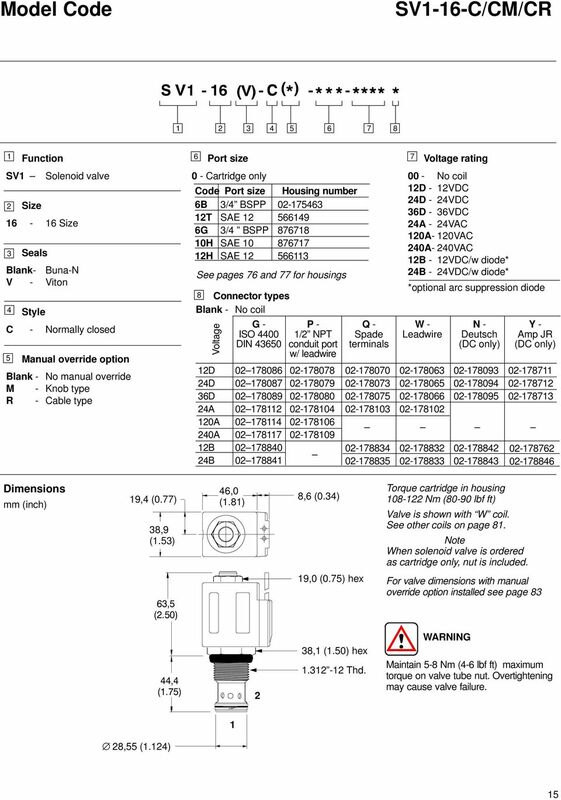 Note When solenoid valve is ordered as cartridge only, nut is included. 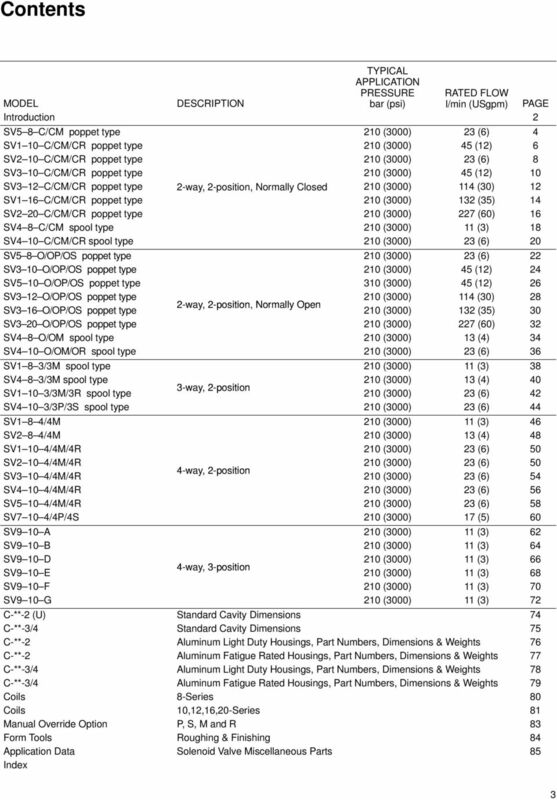 9, (.75) hex For valve dimensions with manual override option installed see page 8 76, (.) 6,5 (.7) 57, (.5) 7,6 (.87) hex.65 - Thd. WARNING Maintain 5-8 Nm (-6 lbf ft) maximum torque on valve tube nut. Overtightening may cause valve failure.